Friends, it is very important to know about what I will advice today. This question comes in everyone's mind. I will answer these questions in this post Can You Run Two Adsense Account With Same Pc and Mobile ..
Every person in this world wants to earn money as soon as possible. Everyone knows this thing. Because I also want to know how I can quickly earn money. And earning online is the dream of everyone. The reason we create a website, open the YouTube channel and also work on them. But you will know that there is a lot of ways (Networks) to earn money online. like Native Ads, Media.net , Adgebra , Google AdSense Etc. . This is a large network through which you can earn money quickly by monetizing your website. And the best and trusted one from all these networks Google AdSense. This thing is known to all. You may have more than 1 blog. Like mine! Can we use same Ip's of 2 Google adsense accounts? 👉 according to the rule of the AdSense, a person can monetize all his sites with just one account.👈 There is no need to create another account to monetize another site. Because you can monetize blogs with the same account..
✓ Now I would like to say one thing to all that you know about the POLICY of the ADSENSE. Then why are you bringing such a question to mind?. Listen to me now don't use multiple adsense account in same android mobile . Even if you thought of doing this, it would not be right for you and your site. Face upside down loss. You can not do this If you have to do this, open any other id from any of your family's mobile. That would be better for you. This will keep you safe. And your first account will also be safe. But don't add two adsense account same bank ok. 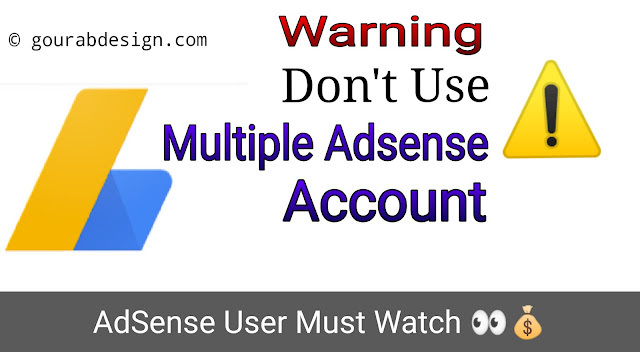 If you try to create another account from the same computer then within a few days you will see a message on Gmail that says you already have an adsense account . So my answer to friends is NO for everyone. Maybe you guys have understood my given tip. Therefore, SHARING this article in the social site . So that everyone can know about this. And nobody can do anything wrong without doing anything wrong. Let's understand beforehand. ✓✓ If you want more information then I have made a video in Hindi too. Look at it So that you can understand it well. If you are still having problems, then please comment below and ask. I'll definitely help you right away. . Thank you. Bye my sweet lovely Readers ❤️... Take care yourself..